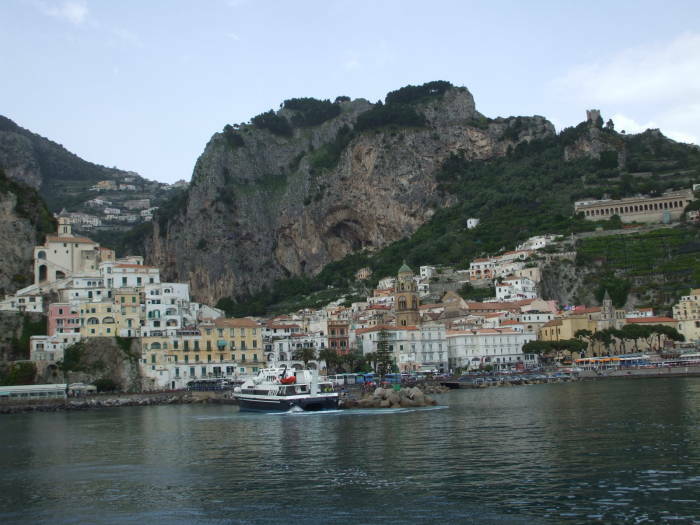 Positano is another famous Amalfitani Coast town. 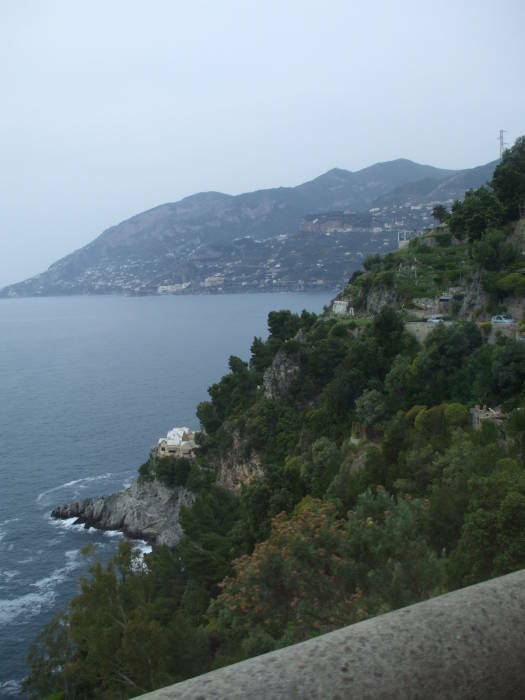 Positano lies to the east along the coast road from Amalfi, about forty-five minutes away by bus. 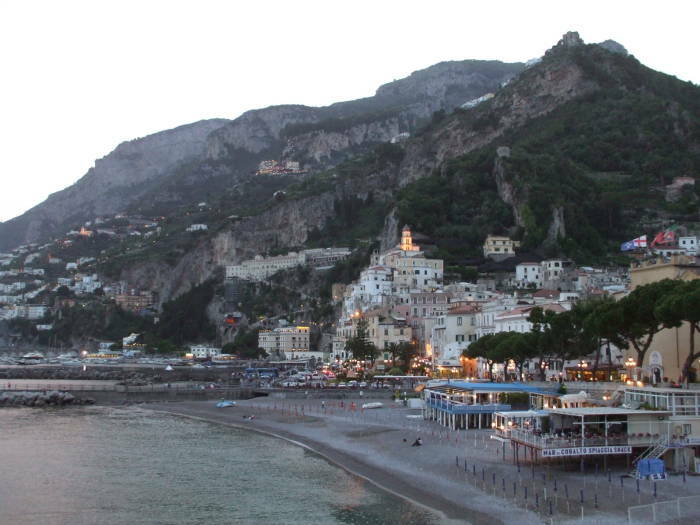 It is a little smaller than Amalfi, with a population of 3,968 versus 5,353, and is almost entirely dedicated to tourism. 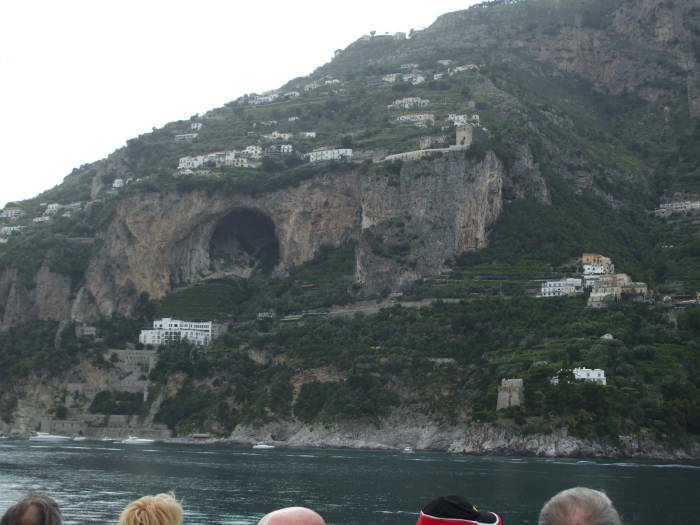 Positano is at least as famous as Amalfi and seems to be even more popular, especially as a place to stay. A number of movies have been filmed here and further increased its popularity, including The Talented Mr Ripley, Under the Tuscan Sun, Only You, and others. 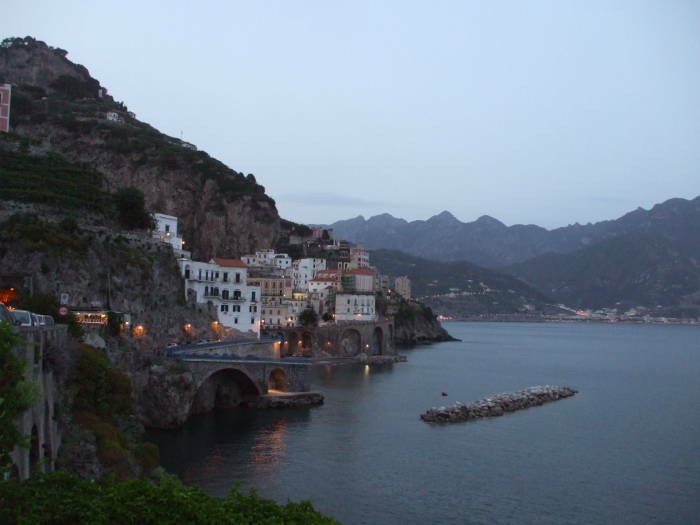 Not that there haven't been a lot of movies filmed in Amalfi, A Good Woman most recently. 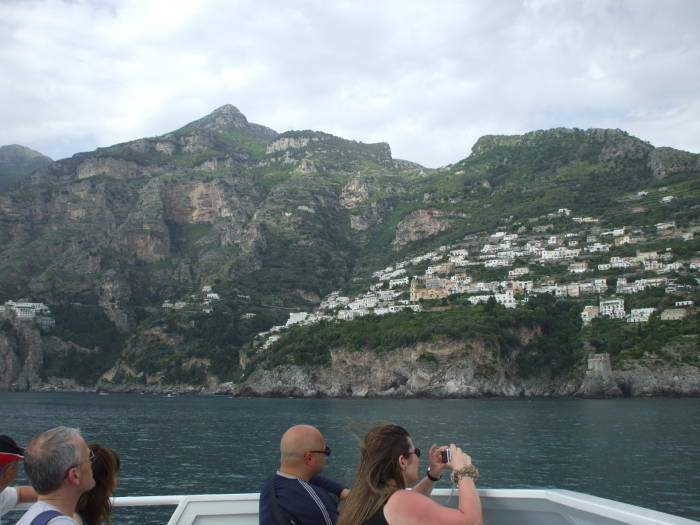 Positano was a port city of The Maritime Republic of Amalfi during its prominence in the 830s through about 1200, While Amalfi never really recovered from the tsunami in 1343, Positano continued to prosper through the 16th and 17th centuries. But then Positano's economy worsened. 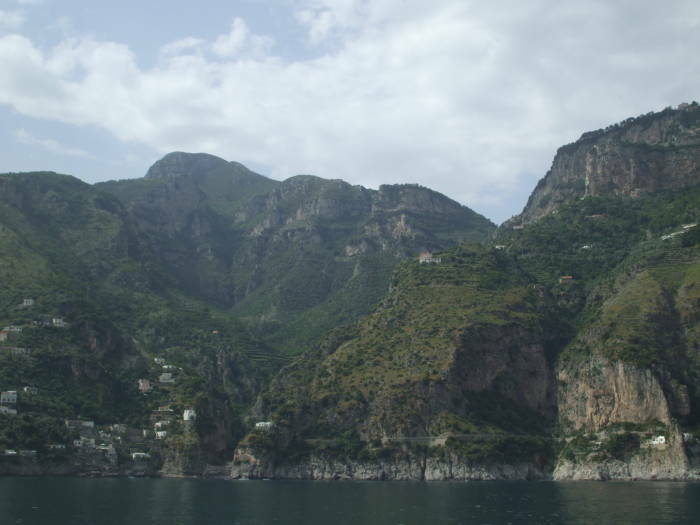 By the mid 1800s, soon before Italian national unification, more than half the population of Positano had emigrated, most of them going to Australia. 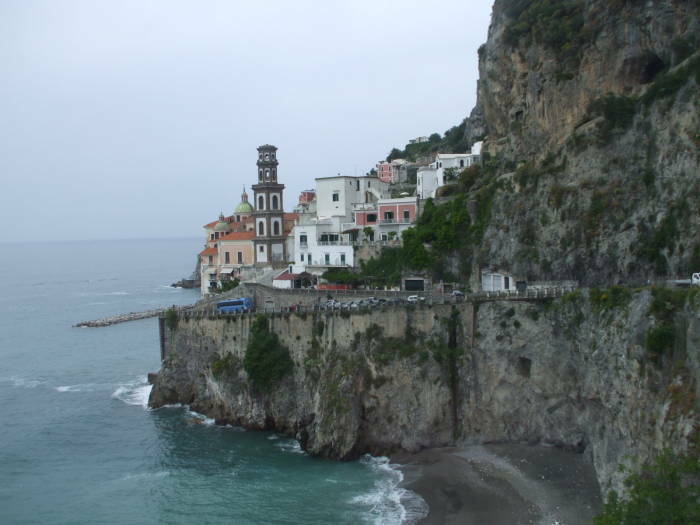 Positano remained a poor fishing village until the end of World War II. 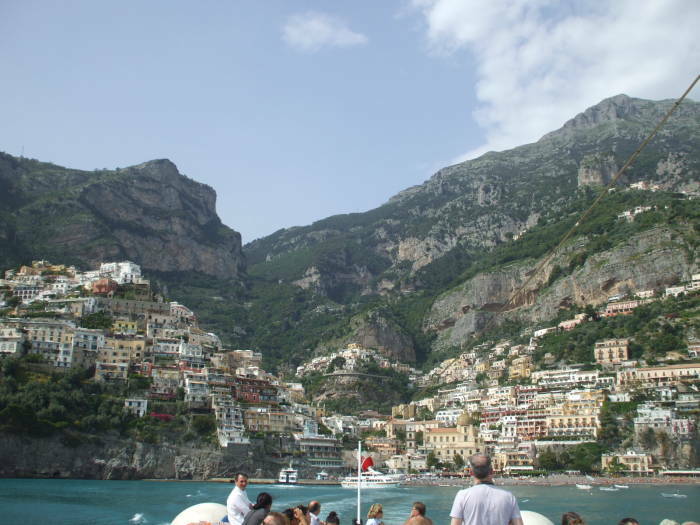 Then the tourists started to arrive (and see The Talented Mr Ripley for a depiction of it in the mid to late 1950s), especially after John Steinbeck's essay about Positano in the May, 1953 Harper's Bazaar. Positano bites deep. It is a dream place that isn't quite real when you are there and becomes beckoningly real after you have gone. Its houses climb a hill so steep it would be a cliff except that stairs are cut in it. 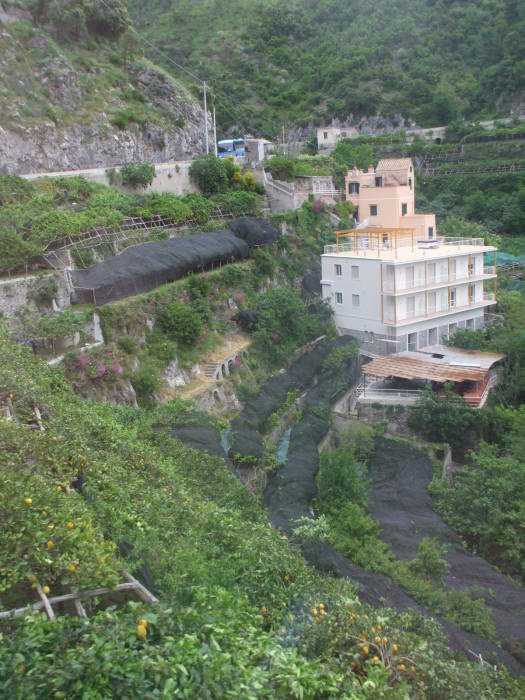 I believe that whereas most house foundations are vertical, in Positano they are horizontal. The small curving bay of unbelievably blue and green water lips gently on a beach of small pebbles. There is only one narrow street and it does not come down to the water. Everything else is stairs, some of them as steep as ladders. You do not walk to visit a friend, you either climb or slide. 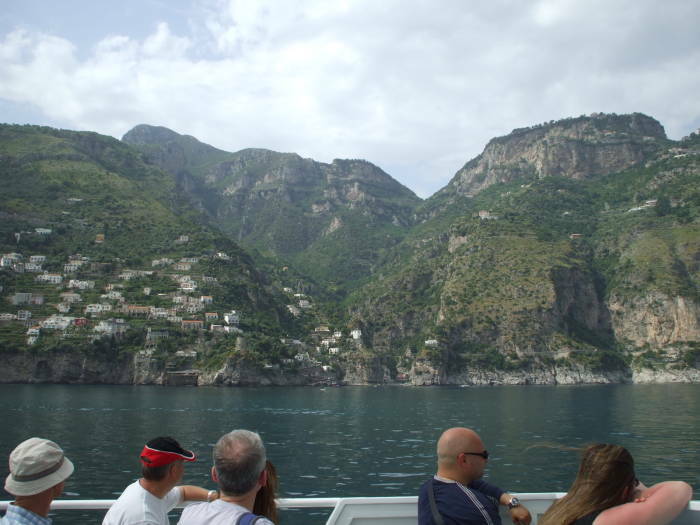 Frequent boats link Positano to Isloa di Capri, to its west, and to Amalfi, to its east. You can really see just how rugged this peninsula is. 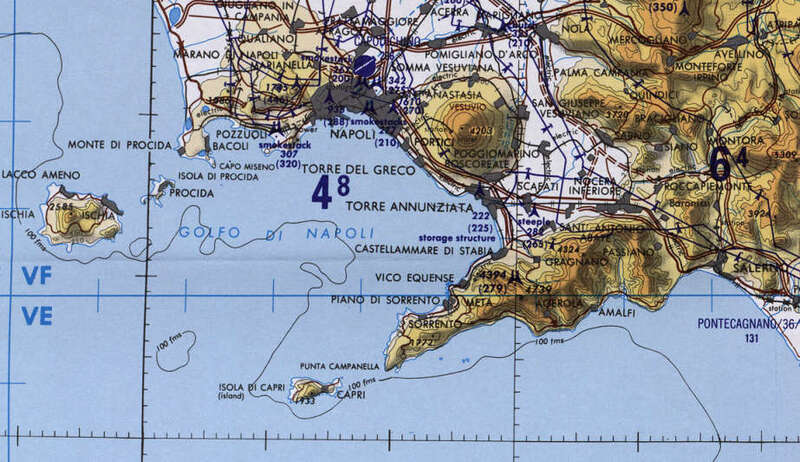 Operation Avalanche, the Allied landings in 1943 were south of Salerno because that was a practical place to come ashore. This coastline would have been an almost impossible location to assault and move inland. U.S. Army map of the 1943 invasion. There are great views all along the way! 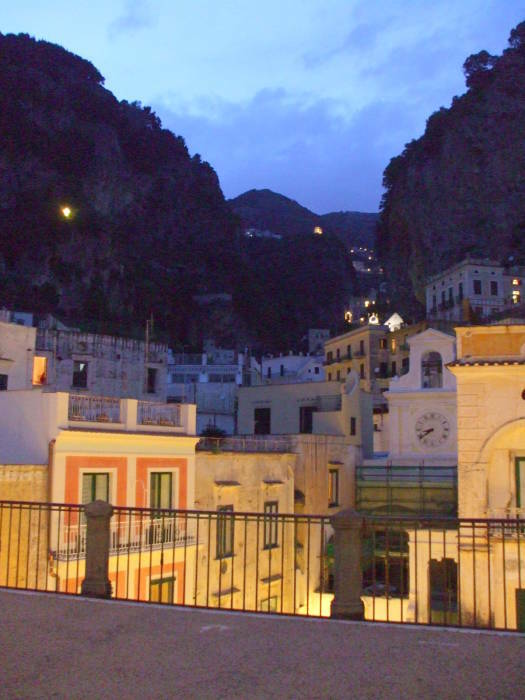 Before long we have returned to Amalfi. 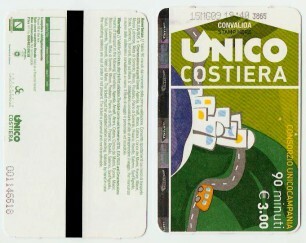 This is the rear and front of a ticket for the bus line along la Costiera, the narrow coast road. It's officially known as Italian highway SS163. Here is a relatively low section of the coast road, where it runs just above the water line. In places it runs about 200 meters above the shore, running along a very narrow and twisting ledge with what seems like next to no barrier to keep the bus from going off the edge and probably making it almost to the water in one drop. Buy your ticket in advance (€3) from a shop near the bus stop, and validate it when you board the bus by sticking it into the ticket validating machine. It is good for 90 minutes from the time it is validated. The bus authorities do make surprise inspections. How do I know? You can also purchase a 24-hour pass, offering unlimited rides for just twice the cost. Notice that it says "24 ore", or 24 hours. But be aware that it means midnight to midnight, and not 24 hours from the first use. I had purchased one in the early afternoon of one day and used it for two rides. At that point I had broken even. 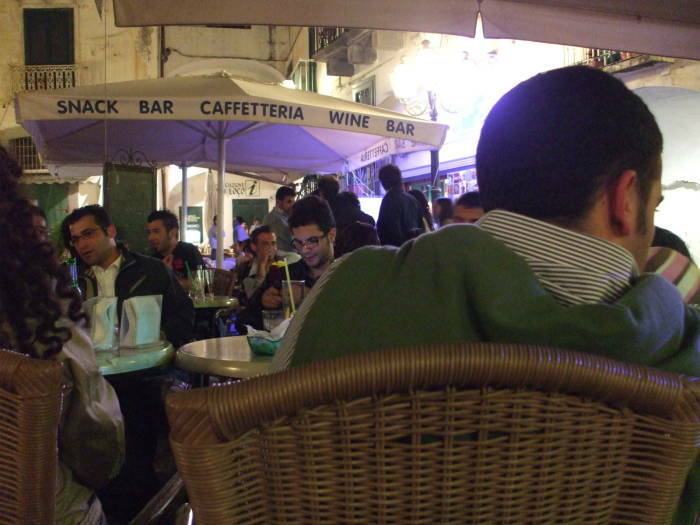 But the next morning I was going to Salerno, and reasoned that I still had a few hours left on my 24-hour ticket. That was not true given the midnight to midnight timing, and of course that was my one bus trip on which bus inspectors got on and examined everyone's ticket. I got off with a severe scolding, then another when we got closer to Salerno. The content of the scoldings was largely neglected in the do-it-yourself audio language lessons, but I certainly got the point. "24 hours" means one calendar day, not a period of twenty-four hours. 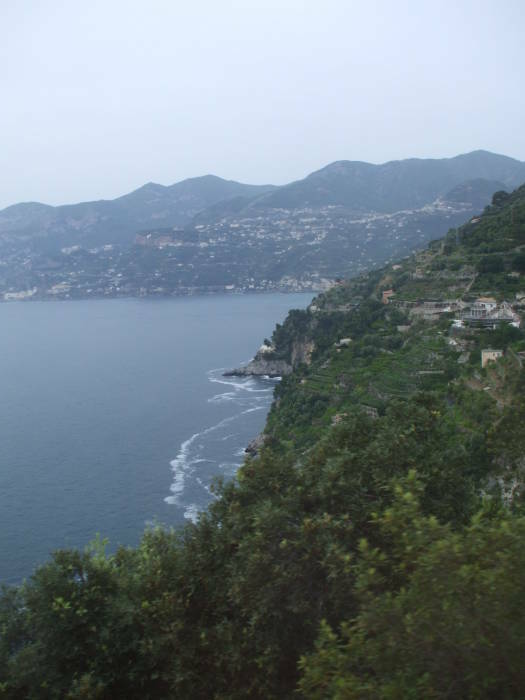 John Steinbeck's essay about Positano in the May, 1953 Harper's Bazaar discusses some aspects of driving along the Peninsola Sorrentina. I hired a driver to take me to Positano. He was a registered driver in good standing. His card reads: Signor Bassani Bassano, Experienced Guide — all Italy — and Throt Europe. It was the "Throt Europe" that won me. Well, we had accomplished one thing. We had imported a little piece of Italian traffic right into our own front seat. Signor Bassano was a remarkable man. he was capable of driving at a hundred kilometers an hour, blowing the horn, screeching the brakes, driving mules up trees, and at the same time turning around in the seat and using both hands to gesture, describing in loud tones the beauties and antiquities of Italy and Throt Europe. It was amazing. It damn near killed us. And in spite of that he never hit anybody or anything. The only casualties were our quivering, bleeding nerves. 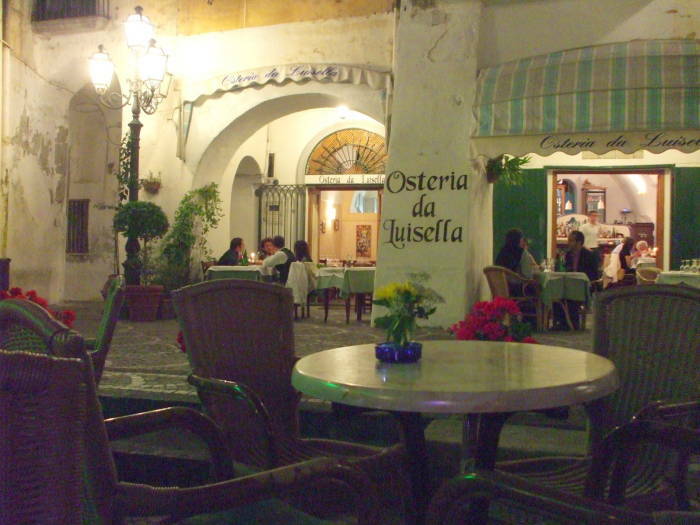 I want to recommend Signor Bassano to travelers. You may not hear much of what he tells you but you will not be bored. 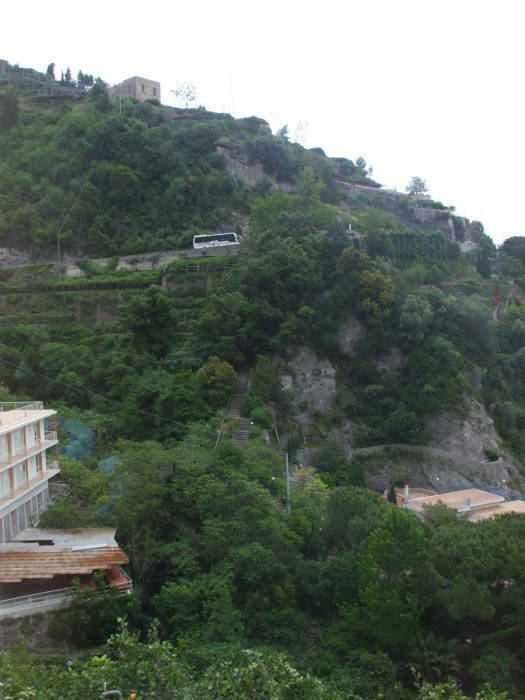 We squirmed and twisted through Naples, past Pompeii, whirled and flashed into the mountains behind Sorrento. We hummed "Come back to Sorrento" dismally. We did not believe we could get back to Sorrento. Flaming like a meteor we hit the coast, a road, high, high above the blue sea, that hooked and corkscrewed on the edge of nothing, a road carefully designed to be a little narrower than two cars side by side. And on this road, the buses, the trucks, the motor scooters and the assorted livestock. We didn't see much of the road. In the back seat my wife and I lay clutched in each other's arms, weeping hysterically, while in the front seat Signor Bassano gestured with both hands and happily instructed us: "Ina da terd sieglo da Hamperor Hamgousternos coming tru wit Leeegeceons." (Our car hit and killed a chicken.) "Izz molto lot old heestory here. I know. I tall." Thus he whirled us "Throt Italy." And below us, and it seemed sometimes under us, a thousand feet below lay the blue Tyrrhenian licking its lips for us. The lights come on as the sun sets and evening falls. 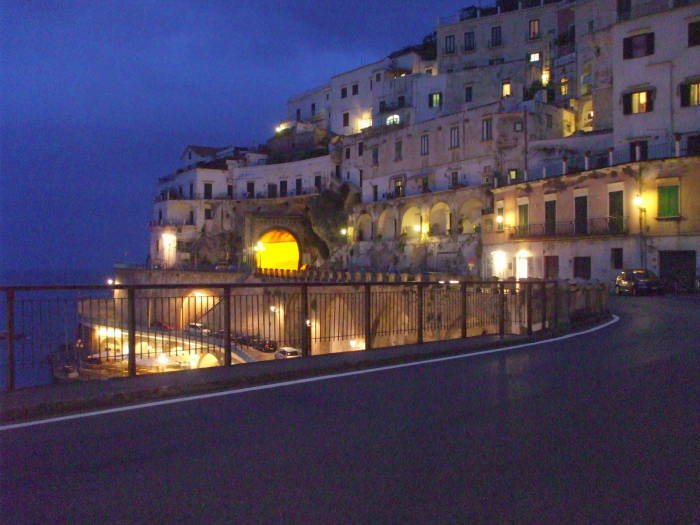 Villages further east, between Atrani and Salerno, begin to appear as thin lines of lights. Traffic settles down as night comes. 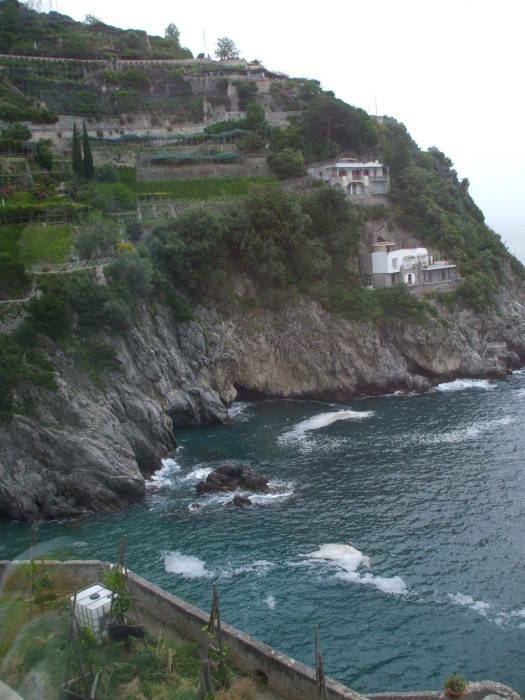 This is the coast road passing through Atrani. 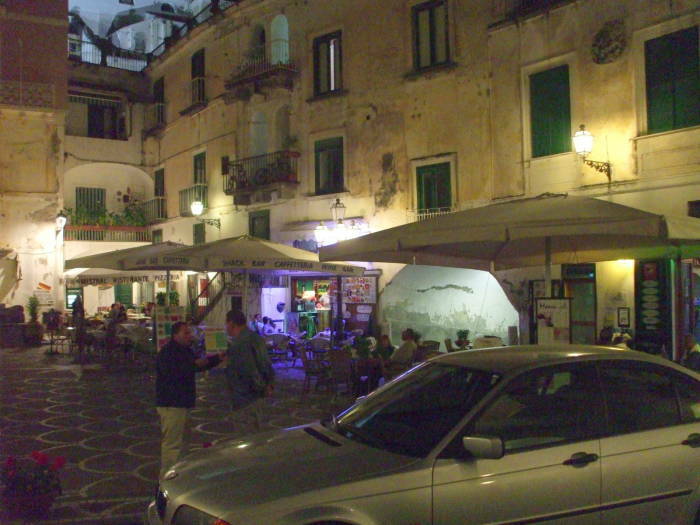 The coast road is just above the third story of the buildings around Piazza Umberto, so from the sidewalk you see over the tops of the nearby buildings and up into the steep valley leading inland. 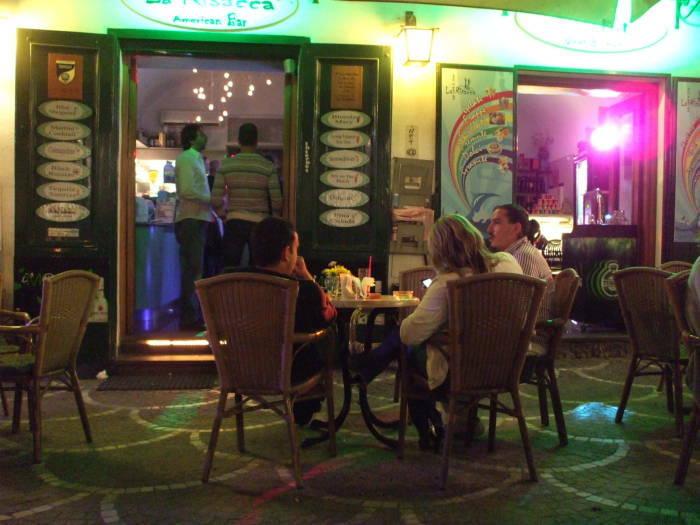 Things may be quiet early in the evening, but business picks up later. 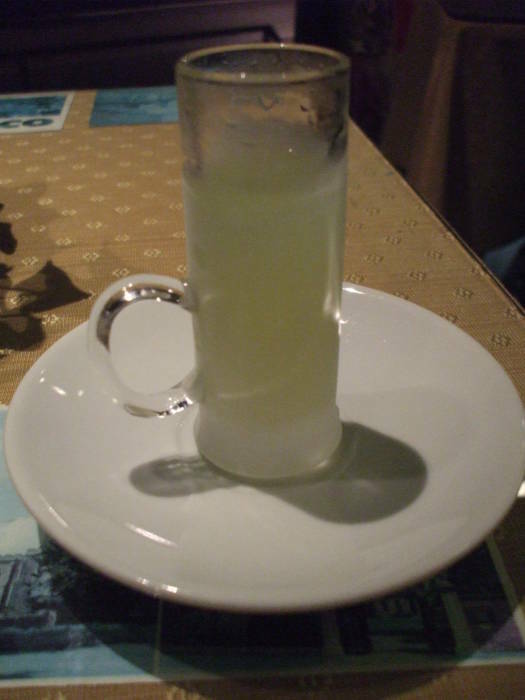 And maybe you will have an ice-cold limoncello after your dinner? It's made from the local lemons! 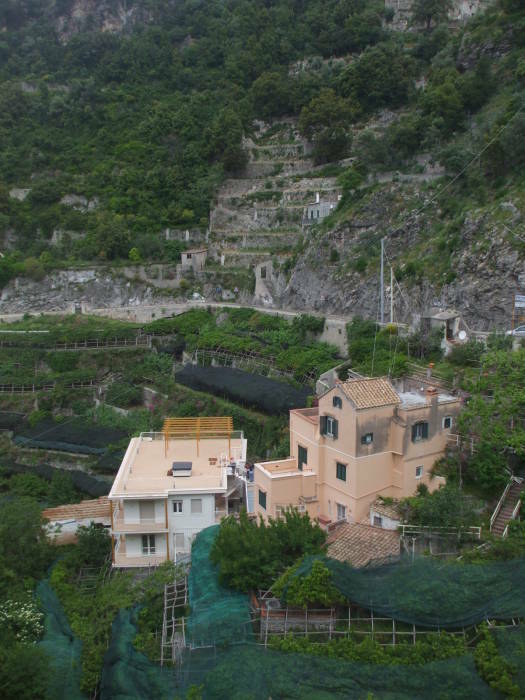 As for what things look like right now in Amalfi, check these webcams.